Words matter. Nomenclature is unassailably essential to the collective ethos and esprit de corps of a people. The concept “people” should be understood to mean a society, nation state, ethnicity grouping or sectarian set of people. A binding ideology is necessary to function in a cohesive fluid manner. This binding ideology manifests itself as a mediator in conflict resolution in time of dispute among the members or the group. Conversely, it manifests itself as a mitigating technique for the group against other groups or individuals outside the group. This is perhaps most evident with religion doctrine where a shared cosmology is the binding ideology. Within this communal cosmology the universal keystone is the creation myth. A creation myth details the inception of a people as it pertains to their historical and psychosocial uniqueness. Through this perceived uniqueness the group attains a social mandate which permeates its cultural, economic, mystical, political and psychological characteristics and motivations. A strikingly similar conviction is equally valid of with groups of people on a modern geopolitical terrain, namely, nation states or countries. What happens when it turns nefarious? When meaningless slogans devoid of context are churned out it then this a form of propaganda. This type of sloganeering is embedded in a sense of false nostalgia. Marxist scholars, especially historians, refer to this propaganda as an invention of tradition which is just a thinly veiled subterfuge to a much starker vile reality. America is the worst offender of control by corporate public relations machines which are obfuscations of their sincere role: propaganda machines fueled, manned and funded by think tanks and lobbyists. Take for instance, the War on Drugs and the War on Terror. These are hollow and vapid tools of rhetoric. They employ heavy handed insipid terminology like “peace, support our troops, democracy and freedom.” They are utterly vague and meaningless without factual (e.g. empirical) context. Consider that trillions of dollars are funneled into the Industrial Military Complex to the benefit of a corporate 1% which engorges itself to the detriment of the remaining 99%.The calculated hubris of this manufactured pathos is seen in the futile wars waged to overthrow regimes which are deemed either non-democratic or not democratic enough in the eyes of the Nation State of America. More often than not these regimes are supplanted by lesser democracies which prove to be more problematic than their predecessor. The binding ideology of the nation state, the manifestation of their perceived uniqueness, is powder keg which awaits a spark of conflict. A conflict which is manufactured and mythologized. If the prevailing invented tradition were not subject to the public relations propaganda machines then maybe other more advantageous and meaningful wars would emerge. Where are the trillions of dollars being poured into the ongoing War on Poverty or the War on Malaria? It is a marketing ploy perpetrated by multimillion dollar corporate snake oil salesmen: the public relations/propaganda machines. The origins of this ideological necrosis in America is most pronounced in the celebration of two invented holidays: Columbus Day and Thanksgiving. Columbus Day is presented as a benign celebration of the discovery of the Americas by European explorers. This is a segment of the total creation myth of the United States of America. 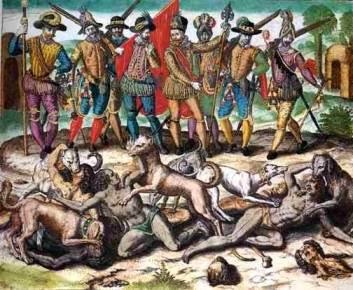 However, Columbus Day actually marks a celebration of the subjugation of cultures and peoples with a unfavorable uniqueness. It is a white washing of repugnant greed and inhumanity. The same is true of the wars on sovereign nations which are marketed to the group (nation state) as less democratic than is viewed by the governing elite as acceptable. Another invented tradition which also represents a portion of the creation myth is Thanksgiving Day. This holiday is buttressed on the propagandized view of the amiable Native Americans aiding the Western European interlopers through a harsh winter of negligible harvest. This invented tradition obscures the unpleasant truth that what is being celebrated on Thanksgiving is genocide and land theft. Why then are these horrific celebrations honoring the destruction of peoples and civilizations allowed to continue? Why are the foundations of these mythological traditions not more closely scrutinized for accuracy? Is the US so beholden to these confabulations of tradition by the corporate propaganda machines that to dismantle the ethos would mean reconstruction of a new binding ideology? Finally, I submit a parallel fable of invented tradition. Would we not cringe at the idea of a thanksgiving where African slaves have gathered in their meager harvest and broke bread with plantation owners? Let's assume that following an abysmally poor harvest after a deadly winter that the white plantation owners of European descent have no or scant food to feed themselves. These African slaves have harvested and cooked grub for years; living and surviving off the land. Subsequently, they ceremoniously invite these white plantation owners (the slave owners), to a feast of bounty. This scenario is ridiculous. The African slaves had nothing to be thankful for just like the Native Americans were not thankful on Thanksgiving.